This article in today’s NY Times is EXACTLY what my column, “Dear Coco,” focused on this week. The article discusses women in politics, and how appearing too feminine is a drawback to image and their campaign. 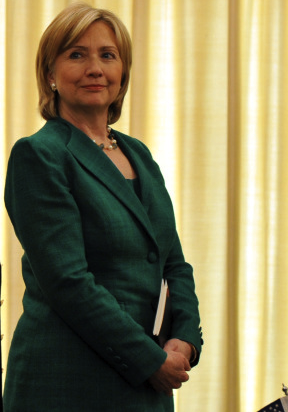 Hillary Clinton - a power suit in every color. The article highlights Sarah Palin and how her more laid-back style shook up the campaign trail in 2008. I am hoping the writer is not implying that it was her style and glamour were what killed the McCain-Palin ticket. It was really more that beneath all of her prettiness, she has no substance. Pretty shiny objects only hold your attention for a short amount of time, if that’s all they are. We need to break this notion that strong leadership only comes through masculinity. This entry was posted in Career, For Your Reference (recommended articles, sites, etc.) and tagged busines suit, career, fashion, ny times, politics, sarah palin, women. Bookmark the permalink.